Material: 95%Rayon, 5%Spandex / 95%Cotton, 5%Spandex(Long Sleeve) Shirt material is very clingy and soft. It's a slinky, non wrinkle material that will travel very well. Sarin Mathews Women's Casual Round/V Neck Loose Fit Short/Long Sleeve T-Shirt Blouse Tops. 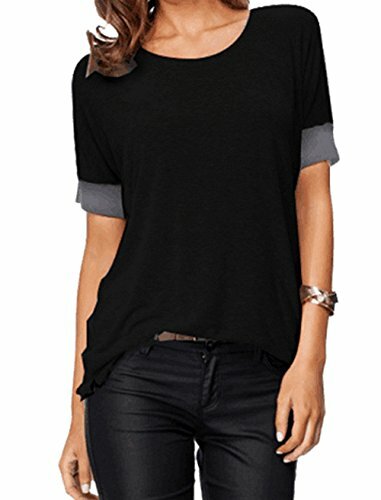 This unique casual loose t-shirt well with leggings and jeans, trendy and elegant item which is suitable for a casual everyday look and any occasions especially for office, parties, clubbing and dating. Casual Short Sleeve Shirt: Bust (S)37.01" (M)39.37" (L)41.73" (XL)44.09" / V Neck Top: Bust(S)36.22" (M)38.19" (L)40.16"s (XL)42.1"